In the time of the ancient Romans and Greeks, excursions to particular events, such as the Olympic Games and all manner of competitions, was a routine ritual of the rich upper class. But even pilgrimages to the temples of the gods were part of contemporary tourism, such as in ancient Egypt and other civilizations which included the hajj to Mecca or the gathering of Hindus at the Ganges River. The introduction of mass transportation means such as rail and ship traffic at the beginning of the 19th century made the benefits of this mobility available to the poorer class as well. Later on, air travel was introduced and completed the list. Manual flight reservation, became too time-consuming and difficult to keep track of as supply and demand grew. With the introduction of Central Reservation Systems, which were founded by airlines in the 1960s, travel agencies had to spend a lot of time entering reservation data manually. The airlines realized that automation of the reservation process would not only increase the productivity of travel agencies but also essentially make them an extension of the airline sales team in a sense. Consequently direct distribution to agencies was added to CRS which eventually became Global Distribution Systems (GDS). GDSs have been the backbone of airline distribution and more for a long time and remain so. Amadeus (Lufthansa, Air France, Iberia and SAS) and Galileo (British Airways, KLM and Swissair) were founded by European airlines; Sabre and Worldspan developed from the internal booking systems of American Airlines, TWA, Delta and Northwest. After all four CRS/GDS were owned by airlines, the U.S. GDS market was regulated to avoid competitive abuse in 1984. These regulations forbade preference of or discrimination against any particular airline by a GDS. For their part airlines publishing fares in the GDS were required to supply all four global distribution systems equally. 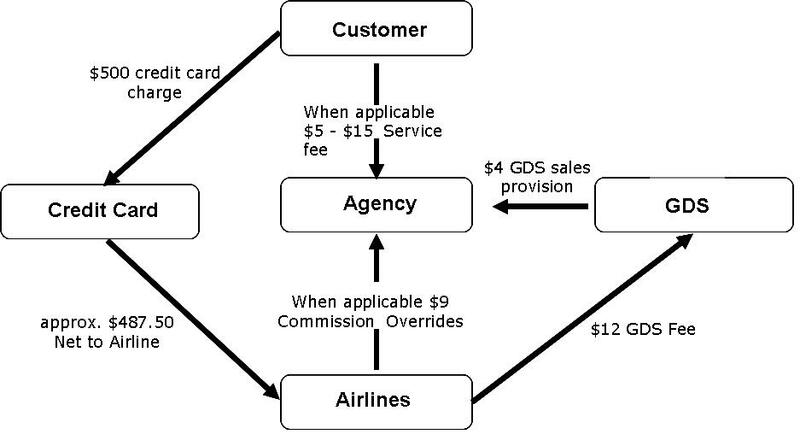 Since the deregulation of the GDS market in the US, airlines are free to negotiate fares with the GDSs and others and attempt to reduce their distribution costs in this way. The Department of Transportation (DOT) dropped almost all of its rules controlling GDSs in 2004, ending two decades of strict regulation of the travel industry. For 20 years the GDS business was regulated by the federal government. The DOT stated that the reason for the deregulation of the industry was mainly because airlines no longer owned or controlled any of the GDSs. This led to a change of the traditional market model where agencies were only paid by GDSs. Today every 5 years there are heavy negotiations between airlines and GDSs about a full content agreement. 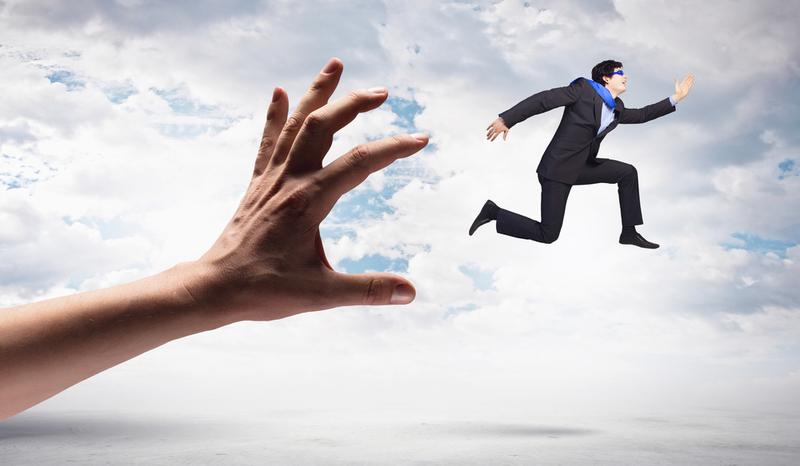 Increasing labor costs have forced agencies to charge clients for touched bookings (sometimes referred to as offline bookings), forcing clients to primarily use an Online Booking Tool (OBT). In Europe, the GDS market continues to be regulated officially but presents itself as deregulated through the behavior of the parent carriers, which place the global distribution systems in competition with one another. This leads to a controversial view: Lufthansa, which is defined as a parent carrier, gave Sabre and Travelport an advantage with the introduction of preferred fares at first. Others see that as tactic of Lufthansa who is known to also fuel competition as a side effect. An interesting transformation has been taking place lately in the online part of the travel sales sector as the value chain below shows. While GDSs were operating leisure Online Travel Companies (OTC) and business Online Travel Management Companies (OTMC) for a long time, they are now systematically selling them to online giants such as Expedia and Priceline. Expedia is well underway to expand its online travel empire and has recently purchased rival Orbitz Worldwide (including ebookers, Hotel Club and Cheap Tickets) from Travelport, just weeks after the takeover of Travelocity from Sabre. Almost all players left in the game are now owned by U.S. giants Expedia or Priceline. Hotels.com, Trivago and Hotwire, among others, belong to Expedia, Priceline owns Booking.com, Kayak and Agoda.com. More than three quarters of U.S. OTA gross bookings will be claimed by Expedia after the completed acquisition of Orbitz. I’m not commenting on the impact of such facts here, but thoughts are always welcome. I am rather interested in the sellers: GDSs. 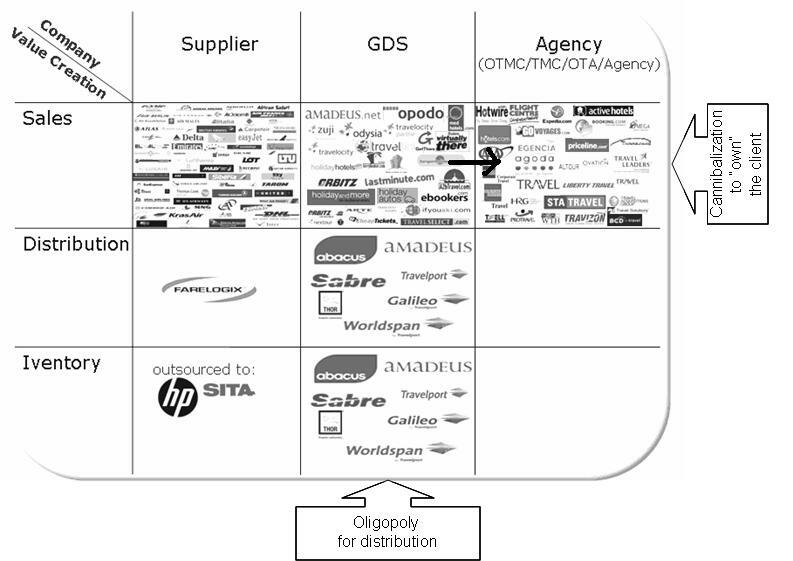 As the graphic of my book 2010 shows, GDSs have controlled the value chain in travel distribution from inventory management (CRS), to distribution (GDS) to online travel sales (Orbitz and Orbitz for business belonged to Travelport, lastminute.com and Travelocity belonged to Sabre, Opodo from Amadeus). It appears GDSs have been withdrawing themselves from operational sales and dropping their oligopoly in this particular field. While they still provide tools such as Agent Desktops and Corporate Online Booking Tools for the sales part of the travel value chain (Sabre Red, getthere, Amadeus E-Travel, etc. ), they are leaving this overcrowded segment as an operator – leaving it to suppliers and agencies/TMCs. The graphic also highlights why: It was this double segment which was too crowded and now with IPOs this had to be cleared up. GDSs will still benefit from agencies for distribution and from airlines through the reservation. In addition they will benefit from airlines and agencies through technology sales (e.g. Lufthansa.com is developed by Amadeus, getthere is part of most TMC offerings). So it only makes sense and still leaves them in control. I like the idea that things are finally lightening up, I still like to further see better technology in the industry and hopefully the market itself will regulate that unbiased technology can only be acquired by a vendor that has no interest in how the ultimate segment will be distributed and in which reservation systems it ultimately ends up. If you want to know more about the history of GDS and the travel industry you can have a look at my book Value Creation in Travel Distribution. Hello, is it by any chance, possible to get Figure 2 in a better format? or simply as a larger image? Thank you in advance!